“Sultanism” is an invented word that keeps popping in comments about Vladimir Putin’s decision to stretch his rule over Russia for as long a quarter century. A few days after the unveiling of a political plan that would allow Putin to rule Russia through 2024, I flew 3,000 kilometers southeast to Tajikistan, one of five nations on the southern flank of the old Soviet Union that are now run by strong men. After one week in Tajikistan, I still do not know the name of the ruling party. 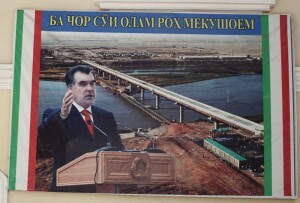 But I sure do know the name and face of Emomalii Rahmon, Tajikistan’s ruler since 1992. On the three hour drive south to the Afghan border, full color billboards with his portrait seemed to appear every 10 minutes. Here he is standing tall in a field of cotton. Here he is lecturing with a pointer on the construction of Rogun, designed to be the world’s tallest dam. Here he is in a black business suit walking through a new monumental arch. In that shot, the angle makes the 59-year-old leader look as if he were wearing a crown. The strong Central Asian sun has not yet faded the photos. 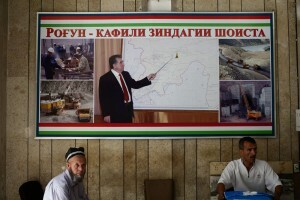 Many were put up in time for the Sept. 9 celebrations of the 20th anniversary of Tajikistan’s Independence. To mark the date – and celebrate Rahmon’s leadership – the government spent $210 million — or 10 percent of its annual budget — on a series of public works projects, including the erection of the world’s tallest flagpole. To the south of Russia, almost all of Central Asia is ruled by strong men. Now billionaires, these politicians have all but declared themselves presidents for life. Kazakhstan has been ruled since 1989 by a man of humble origins, whose parents had the foresight to name him Nursultan, roughly “Sultan of Light.” Nursultan Nazarbayev rose to become First Secretary of the Kazakh Communist Party. As he concentrated more and more power in his hands, Nazarbayev faced calls from supporters last year to formally taken on a new title: President for Life. But as the Arab Spring shook autocrats from Tunisia to Syria, Nazarbayev decided to hold a quick election in April. He easily won reelection with 95.5 percent of the vote. With another five year term, he now has a mandate to rule Central Asia’s richest nation through the age of 75. Next door, Islam Karimov, has run Uzbekistan, Central Asia’s most populous nation, since 1989 when he became First Secretary of the local communist party. In the last presidential election, in 2007, his ‘rivals’ had only praised for him. He won 88 percent of the vote. Now 73 years old, Karimov shows no sign of stepping down. Last week, he talked on the telephone with President Obama about expanding use of Uzbekistan to supply NATO troops in Afghanistan. The leaders of Uzbekistan and Kazakhstan have daughters, but no sons. In the patriarchal societies of Central Asia, this seems to rule out creating a dynasty. Back across the Caspian in Central Asia, Turkmenistan and Kyrgyzstan offer two end games for “sultanistic” rule. In Turkmenistan, Saparmurat Niyazov took over leadership in 1985, when he became First Secretary of the local communist party. Over the next two decades, he progressively went haywire. He renamed months of the year, schools, towns and airports after himself and family members. Flush with billions of dollars in oil and gas earning, he erected in the capital a gold-plated statue of himself that revolved around the clock to eternally face the sun. Calling himself Turkmenbashi, or leader of all Turkmens, he closed hospitals and required reading in schools of his book of political thoughts. Newscasts began with the pledge that the announcer’s tongue would shrivel if he defamed the nation or Turkmenbashi. In a final bizarre act, he ordered pensioners to repay to the state the pensions they had received in the previous two years. Niyazov, who enjoyed the best health care in the nation, died unexpectedly in December 2006, at the age of 66. 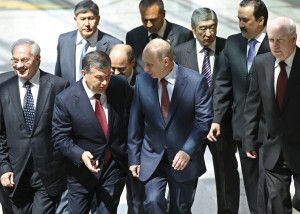 Two months, later Gurbanguly Berdymukhammedov, was elected president of the one party state. The last Central Asia nation, Kyrgyzstan, is the only one with a political system that the Kremlin seems to find unsettling. Starting in 2005, Kremlin strategists started to organize to block the possibility of a so-called “color” street revolution at home. The Orange Revolution had defeated a pro-Russian candidate in Ukraine. The Rose Revolution had brought Mikhail Saakashvili to power in Georgia. And the Tulip Revolution drove from power Askar Akayev, who started politics as First Secretary of the Kirghiz Soviet Republic. Today, in an oddity for a region run by sultans with cellphones, Kyrgyzstan is run by a woman, President Roza Otunbayeva. On Sunday, Oct. 30, Kyrgyzstan is to have presidential elections. There are 20 candidates. Then, in the Kremlin’s eyes, things get really weird. No one knows who will win the election. Your articles on political situation in post soviet countries and in Russia are perfect and precise. He certainly took the Cue but without any rights to do so. 1.Almost all mentioned Presidents were men of honor and distinction even before the demise of the USSR. 2. J.Stalin, the tyrant whom he admires, was a revolutionary in tsarist Russia, personal comrade of V. Lenin. He was exiled and convicted for his political views and activities. 3. L. Breshnev was a WWII hero. 4. Yeltsin was popular for his opposition to the ruling CPSU. To cut short, you got the picture. But who was Mr. Putin (with Botox to make his face immortal) before the collapse of the USSR? Humble rank and file senior officer. What was his remarkable political vision for revival of Russia? Just common KGB reports on all dissidents. Where was it published? Not a clue. Did he have any masterpieces as Solzhenitsin had? Or maybe scientific papers? I don’t mean his recent economic thesis which English Wikipedia claims isn’t an original at all. He was just the common man in right place to force democratically elected Eltsin by any means from power after the Communist coup d’etat had failed. With dubious ties, connections and deals. The reason for his ascend was to restore the CPSU idea of communism in disguise and to dismount democratic aspiration of the nation. And he did. The same idea of dogmatic and stagnant Communism. Even Chinese idea of Communism was greatly advanced and prudent. Putin’s gamble will probably work, as long as oil prices stay high. 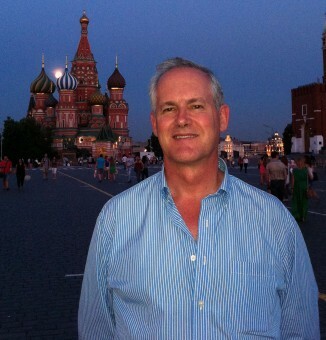 If there is a prolonged drop in commodity prices, things in Russia will get pretty ugly. James, great post as usual! Now, tell me who your friends are and I’ll tell you who you are. These words of the great philosopher could be a good prologue to your article. It is hard to not notice the love relationships of Putin’s government with all sorts of dictatorships, and hostility to those nations who are trying to establish democracy. Putin and his KGB associates admire Stalin not because he “.. was a revolutionary in tsarist Russia, personal comrade of V. Lenin” but because Stalin, a Georgian, with the assistance of a few Jews, a few Russians, an Armenian, a Latvian, etc. had managed to raise the USSR to the superpower status, – unprecedented in the history of the Imperial Russia. Your term “Breshnev was a WWII hero’ is completely off the mark. Brezhnev was a typical Comparty apparatchik who served as a politruk, a political commissar, certainly not as one of prominent military commanders or strategists. To call him ” a war hero” is a profanity.